OSLO, Norway, June 8, 2011 (ENS) – Japan now has said that radioactive emissions from the earthquake and tsunami stricken Fukushima Daiichi nuclear power plant during the first hours following the dual disasters were perhaps twice as high as previously estimated, putting the accident’s gravity at about 40 percent of radiation released at Chernobyl. The upwardly revised figures call into question yet again the Japanese government’s accuracy and timelines in reporting on the accident. The plant’s owner, Tokyo Electric Power Co, or TEPCO, admitted on Monday that reactor Units 1, 2 and 3 experienced full meltdown. 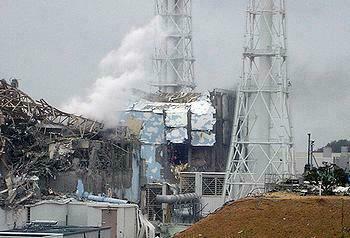 TEPCO had said last month that all the fuel at reactor Nos 2 and 3 had melted during the first week of the crisis. In the weeks previous to that announcement, the government had maintained that no fuel meltdowns were possible. Japan’s nuclear regulator, the Nuclear and Industrial Safety Agency, NISA, said it now estimated that the radioactive release from the plant totaled 770,000 terabecquerels in the first week after March 11. The agency had previously estimated 370,000 terabecquerels released in the first month. A terabecquerel is a trillion becquerels, a commonly used measure of the radiation emitted by a radioactive material. NISA initially suggested that the higher emissions estimate was equivalent to only about 10 percent of the radioactive materials released in 1986 by the explosion and fire at Chernobyl in the former Soviet Union, still considered the world’s worst nuclear plant disaster. But the 770,000 terabecquerels figure in fact comes to about 40 percent of the official Soviet estimate of emissions from Chernobyl. Most experts say that the true emissions from Chernobyl were 1.5 to 2.5 times as high as the Soviet Union acknowledged. Assuming that the true emissions from Chernobyl were twice the official figure, the Fukushima nuclear accident has released 20 percent as much as Chernobyl, according to Japan’s new estimate. The new estimates are hardly final, say experts, and it could be that even the new estimates will be upwardly revised. “The Japanese need to have international authorities come into the plant so that they can get an educated second opinion on how accurate their figures are,” said Bøhmer. NISA confirmed this, saying that both the old and new estimates for radioactive fallout involve large margins of error. 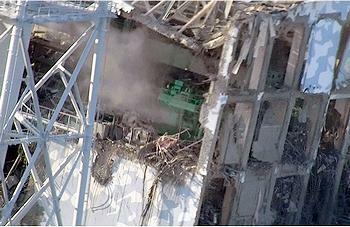 Japanese officials have been at pains since the beginning to stress differences between Fukushima Daiichi and Chernobyl. At Chernobyl, a burning graphite reactor pushed radioactive particles high into the atmosphere and downwind across Europe. At Fukushima, Japanese authorities say, the leak mostly produced radioactive liquid runoff into the ocean and low-altitude radioactive particles that have dispersed into the ocean, which suggests that the crisis could pose fewer health risks. But research has shown that radioactive particles from Fukushima Daiichi have been measured nearly everywhere in the northern hemisphere. Vladimir Slivyak, co-chair of Russia’s anti-nuclear advocacy organization Ecodefence says assertions that these measurements are “insignificant” are simply false. Determining that there is radiation is different from establishing what kinds of radioactive isotopes are in the air – and those are what are breathed by humans, increasing the likelihood of cancer, both Slivyak and Robert Alvarez, a former nuclear official with the Clinton era U.S. Energy Department have noted. How badly did the reporting error hurt the Japanese public? It remains unclear whether more accurate readings of the radiation in emissions coming from the plant would have elicited a swifter response from the Japanese government and widened the 20 kilometer evacuation zone around the Fukushima Daiichi power plant. The United States and Norway, even under the previous estimates, urged its citizens living in the area to relocate to at least 80 kilometers (50 miles) away from the plant. Environmental groups from Oslo-based Bellona to the Washington-based Union for Concerned Scientists to Russia’s Ecodefence, and even the U.S. government, have commented that the lag in official reporting has done nothing but add tangles to already contradictory data and analysis from Japanese authorities. Some groups and experts have even said the government has tried to block the release of information. It is not uncharacteristic for Japan to admit to a nuclear breach, and over time to release more and more dire information, as was the case after an earthquake that effected the Kashiwazaki-Kariwa nuclear power plant in 2007. 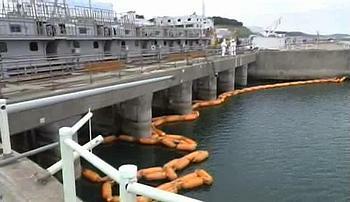 Initial reports from Kashiwazaki-Kariwa, also owned by TEPCO, said 60,000 bequerels of radioactivity had been released into the Sea of Japan when either 1.5 liters of low level liquid waste, according to one report, or 1,190 litres, according to another, had sloshed out of the plant’s No 6 reactor. Pushed by then Japanese Prime Minister Shinzo Abe, environmental groups and world media to be more definite in its damage estimates, TEPCO finally admitted the spill had been 50 percent worse than it had first said and that radiative gas had been released into the atmosphere. Japan’s assessments at Fukushima Daiichi have been based largely on computer models showing heavy emissions of radioactive iodine and cesium from March 14 to 16. Officials have said that the emissions peaked during those days, and have dropped sharply since. Even at the time of the first estimate in April, Japan’s Nuclear Safety Commission, an independent government panel, called the reading too low. Its own estimate was 630,000 terabecquerels in the first month, or about 34 percent of the official Soviet estimate and 17 percent of the unofficial higher estimate, the “New York Times” reported. The commission relied on a computer model that uses radiation measurements taken at various distances from a nuclear accident. The model produces an estimate of the radioactive material escaping from the source. But the Nuclear and Industrial Safety Agency based its number on estimates of the damage to the reactors’ radioactive cores. The agency said its latest reading more accurately reflects the radioactive material spewed after hydrogen explosions at reactor Units 2 and 3.